Endless tea parties, baking marathons, and costumes galore. Every year it happens. There is always (at least) one child in my class who wants to play in dramatic play all. day. long. 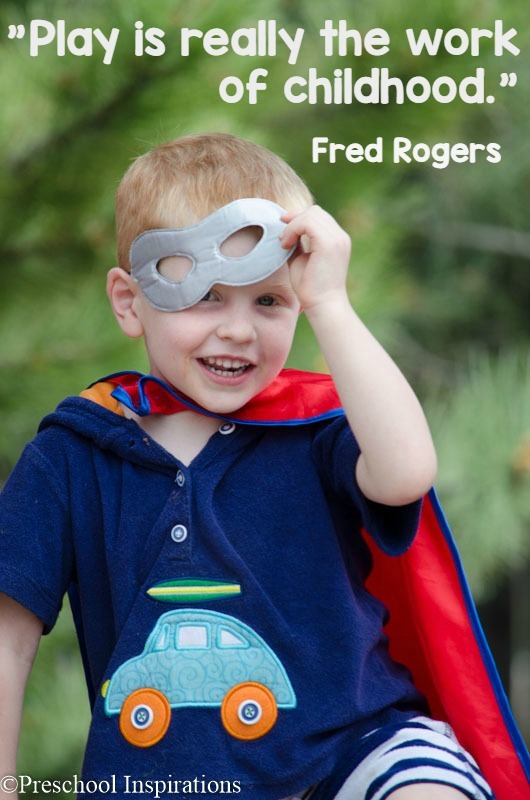 This special area of creativity and role play might be referred to as dress-up, kitchen, pretend play, home living, or some variation of that. Perhaps you are familiar with the incredibly strong magnetic attraction pulling in children toward this world of imagination. When I worked in a center with a large classroom, I had so many children who wanted to play there. How do you get 24 children to share this little space? Unfortunately, my solutions back then were not ideal! I had a time limit whenever the demand was high. I honestly do not like putting time limits on kiddos in areas that they love, so this option was made out of necessity, but it was certainly not my first pick. With my in home preschool, my class is small enough that everyone could play there all day…and some days I have a kiddo or two who does. And then the pendulum shifted. Now that I had the availability and resources for children to play in dramatic play all day, I started to feel guilty. I was second guessing myself. Should I let children play in the same area all day? Sometimes I felt that it must make me an unbalanced teacher because I’m not exposing them to enough learning domains. Their kindergarten teacher would wonder what we did all day after all! I mean, we needed to work on math, writing our names, reading books at least 20 minutes a day, and we most certainly should be practicing cutting and memorizing our phone numbers and addresses. Right? This had to be sorted out, the inner battle going on inside of my mind and even my heart. I took a deeper and closer look at what was happening in my kitchen/ home living/dress-up area. There was a transformation taking place. This area was drawing the children in, and it was because of a beautiful process that was taking place. A transformation that I am glad I did not disturb after realizing what was truly going on. Instead of distracting the children from dramatic play or drawing their attention elsewhere, I took notes. I wanted to figure out why they were being beckoned there. I believe children are incredibly smart. I believe that when they have strong tendencies, there are reasons behind this. They teach me everyday, so I decided to step back, observe, listen, and let them show me what was really going on. What exactly was going on with the children who wanted to dress up all day? Initially, I would have thought that the meek and peacemaking children would be the ones playing there the most. After all, they could get along so well with one another. Don’t get me wrong! Those sweet, amicable children do love this area — but they are not the ones who stay. Instead, it is my students who really struggle to manage their feelings and emotions who wanted to play in dress-up all day long. Some days I was exhausted with mitigation efforts. How draining to help two or more children work out their differences for hours in a day. I didn’t work it out for them though. I know they had the capacity to solve this, so I gave them the duty to fix it. Day in and day out, we practiced these skills. Lo and behold, they got better! They weren’t perfect, nor will we ever be, but they absolutely made me proud and brought smile after smile to my face. The arts in general are amazing. They help us decompress, give us an outlet to work through hard situations, offer an amazing outlet for creativity, and even help us work through situations we did not know we were struggling in. Dramatic play is these virtues to a child as well. I see children work through situations they’ve experienced during their time in home living. Some have been devastating, especially the time one of my sweet kiddos had her daddy ripped away from her one day. Dramatic play was a great outlet to her, and unfortunately I was not at a place back then that I realized how much she needed it. I would have done so much more to support her if I had known back then what I know now. Not all situations are dark or sad though. Perhaps a family is moving or having a baby. I especially love seeing little ones practice their future sibling skills while in dramatic play. When I became pregnant with my third child while teaching this past year, my whole class went through a baby loving phase. It was so sweet to see them process my belly growing. They would seek out the baby dolls, wash the babies, and just hold and snuggle them. A few have decided they would even like their own sibling at their own house as an addition to their family. Children are reflecting on roles and actions people who are close to them take. While they may not talk to us about certain events, they play it out in dramatic play. There is comfort and familiarity in a “kitchen area” for a child who goes to school. They see the kitchen at home and when they are at school, it can become a refuge. When a child first starts preschool or school and is slow to warm up to the environment, the dramatic play area will usually be the key to draw them in (or our awesome calm down discovery bottles). I love when I come across the ultra quiet and shy little ones. They are a mystery for me to unlock and “peel away the layers of the onion.” If I ask them a question, I may or may not get an answer. It’s not that they are giving me the cold should though. They will come around and warm up to myself and the class. Usually I am sitting next to them at their restaurant or home as they serve me dessert after entree after snack after appetizer more snacks and more dessert. They give me their food…and then I hear a few words. Back to the cafe they go to bring me more food. As I eat the next plateful of desserts and sandwiches, I begin to hear more. Then it’s an open book. The bedtime routine, mommy’s favorite color, or even daddy’s job have now become the topic of conversation. Sometimes I don’t ever have to ask a question. Other times, I hear about family secrets. These children use this area to 1) find comfort, 2) play independently, and 3) begin building relationships with the teacher and their classmates. Pretty soon, the quiet, meek child is leading the role playing and directing everyone. How do I feel about the child who is in dramatic play all day? As you may have guessed, I no longer have reservations about children who want to play in dramatic play all day now. In fact, when we upgraded our classroom kitchen, I put the old one outside so that we could extend it there. Some days it is a busy, high demand area out there, but many times it’s not. They all go through stages and phases as to how often and long they want to be there. We also extend dramatic play and pretend play elements to other areas of the classroom so that the children have this beautiful outlet in almost every learning center. Oh and I even put lots of math and science and writing materials into dramatic play too. Overall, it is a blend. It is also more than what I just wrote about. Each child, each group of children, and each classroom is unique. You will have to find out the answers to your own children. Learning does not take place merely by subject to subject or lecture after lecture. It is moment by moment. And I really like that!